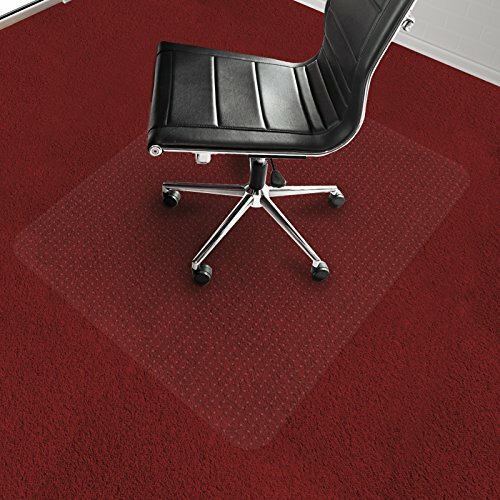 Office Marshal® Carpet floor chair mats made from 100% newly manufactured polycarbonate - Designed to ensure genuine quality and complete reliability. The durable polycarbonate structure of this mat prevents against the everyday wear and tear caused by office chair casters and helps preserve the appearance of your floor. Polycarbonate offers the ability to transmit light almost as well as glass, allowing the beauty of your floor to shine straight through. Due its many notable properties such as high impact strength, heat resistance and high transparency, polycarbonate is currently the most reliable material for the manufacturing of chair mats. CRYSTAL CLEAR: 100% pure polycarbonate - Highly transparent, rigid and thick. Polycarbonate chair mats are an affordable alternative to glass mats thanks to their strength & transparency, providing effective protection whilst allowing the beauty of your floor to shine through. UNBEATABLE DURABILITY: The material of choice for making bulletproof glass and vests, chair castors are a breeze for the hardy polycarbonate, providing unbeatable protection against chair castors. The best chair mat material, which will not bubble or compress under pressure. EFFORLESS ROLL, STABLE GRIP: Designed to allow chair castors to glide freely as if on a hard floor surface, but has enough grip to maintain controlled rolling so the chair doesn't skid around. Ease of movement whilst carrying out daily tasks promotes ergonomic posture and helps to considerably reduce the risk of leg fatigue. SUPER GRIP BACKING: Studded underside holds the mat firmly in place - Suitable for use on low/medium pile carpets (Max. pile: 0.6"). Office Marshal® best-selling chair mats are designed to provide high impact resistance and under standard use will not crack, curl, break, scratch or discolor. BUY WITH CONFIDENCE: Office Marshal® are dedicated to providing premium quality products for your home and office without the heavy price tag charged by many of our competitors. Experts in ergonomic chair mats, our vigorously tested product range is sure to meet all of your needs. Certified by TÜV Rheinland (a global provider of technical, safety, and certification services throughout the world).